Energy consumption of any component in a system may sometimes constitute just a small percentage of that of the overall system, making it necessary to address the issue of energy efficiency across the entire range of system components, from memory, to the CPU, to peripherals. Presented is a hardware architecture for detecting regions of application execution at runtime, for which there is opportunity to run a device at a slightly lower performance level, by reducing the operating frequency and voltage, to save energy. 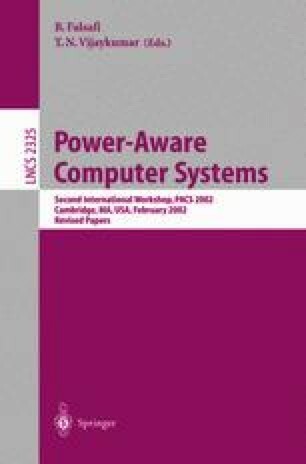 The proposed architecture, the Power Adaptation Unit (PAU) may be used to control the operating voltage of various system components, ranging from the CPU core, to memory and peripherals. An evaluation of the tradeoffs in performance versus energy savings and hardware cost of the PAU is conducted, along with results on its efficacy for a set of benchmarks. It is shown that on the average, a single entry PAU provides energy savings of 27%, with a corresponding performance degradation of 0.75% for the SPEC CPU 2000 integer and floating point benchmarks investigated.